USTIN, Texas -- Mack Brown has asked for a show of hands. It's Sunday afternoon, Sept. 5. He is standing in front of his Texas football team on the day after its 34-17 season-opening victory over Rice. Brown and his assistants have just run through game video with the players, offering commentary on all phases of the Longhorns' performance. Positives are sprinkled in among the critiques. Brown has congratulated his team on being 1-0, and called for the players to applaud themselves. But the clapping was brief, and now it's time for the man in charge of arguably the biggest and most valuable brand in college football to drop some hard, big-picture truth on his players. "Raise your hand if you played with as much passion and emotion as you ever have in a football game," Brown says, then looks out and counts the hands. "How much do you like being at Texas and like being a football player?" Brown continues. "Some of you like being at Texas more than you've earned the right to be here. "I was embarrassed for myself. I was embarrassed for some of my coaches, not all. I was embarrassed for some of you players, not all. "Boy, I'm scared. I'm worried about this team. I'm worried about it. "We've got some entitlement in this room. Got to get that fixed. Got some selfishness in this room. Got to get that fixed. This isn't Texas football. "What concerns me, we've got guys in this room who have won too easy. You're ranked the fifth-best team in the country, and we just played OK. We have not earned that ranking." For all the people who have labeled him "Mack the Nice" -- too soft on his players to make them as good as they can be -- this was an illustrative moment. He wasn't very nice. Not mean. Not browbeating. Not profane or insulting or bullying. 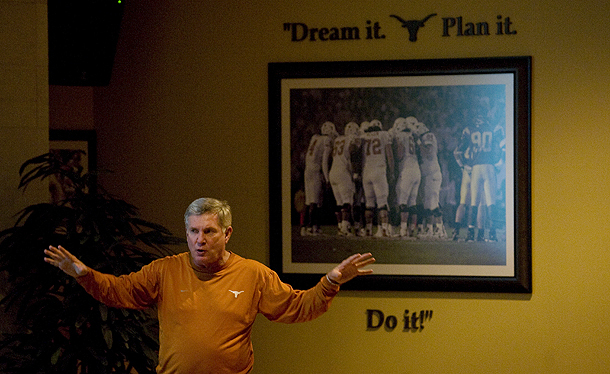 Being a motivator and a critic are just two parts of Mack Brown's job description. Two hours later, Mack Brown is walking with his wife, Sally, to the team's Sunday victory dinner in an opulent dining hall in 100,119-seat Darrell K Royal-Texas Memorial Stadium. He sees wide receiver Marquise Goodwin ahead of him, wearing a New York Yankees hat, and calls him over. "Would you please tell your fellow receiver Mike Davis that the Yankees don't wear red?" Brown asks, exchanging a playful fist bump with Goodwin. "He has a red Yankees hat. I hate red." For the next 90 minutes, Brown is once again the paternal jokester who won over these players and their families as high schoolers. He is literally hands-on in expressing his affection for the players he just chewed out -- grabbing an elbow or a neck, slapping a belly or a back, giving a hug. "We separate what we say out there [in the film room] with what we say in here," Brown says. "In here, we ask about their families and have fun with them." During dinner, Brown quietly consoles cornerback Chykie Brown over the loss of his uncle Friday night -- the coach didn't hear about it until Sunday morning. He congratulates several freshmen on getting their first playing experience, asking each of them, "Did you have fun?" And he gives the business to Mike Davis when he sees him. "Did Marquise talk to you?" Brown asks, blue eyes twinkling. "The Yankees wear a blue hat, not red." Davis, a highly touted recruit who was in on 38 plays against Rice but did not catch a pass in his first college game, breaks into a smile. "Did you block anybody yesterday?" Brown needles. "Look at the film!" Davis says, laughing. Brown has looked at the film. Three times, in fact, in less than 24 hours -- once he watched the broadcast copy, twice he watched the team's own cut. He'll review it one more time that night before moving on to discs of the next opponent, Wyoming. Being a film freak is part of the Texas football coach's job. So is being the bad guy. And the father figure. And the motivator. And the face of the program to recruits, boosters, media and fans. There are so many parts to Mack Brown's high-paying, high-pressure job that it's amazing one man can perform them all. ESPN.com gained unprecedented access to his program to see how he does it.